We will custom design a pre-retirement seminar for CSRS or FERS employees, mid-career seminars for employees in both systems, or Benefits 101 classes for new FERS employees which include insurance, social security and TSP information. Multi-day classes include a session on general retirement planning, both financial and personal. All our seminars come with an additional 30 days of free email questions for seminar participants. We also have separate short "lunch and learn" type classes in benefits including open season elections for health, flex spending, dental, and vision insurance, as well as managing your TSP, life insurance and other benefits during your career and on into retirement. We specialize in individual retirement estimates for FERS, FERS Transferees, CSRS, and CSRS Offset employees. 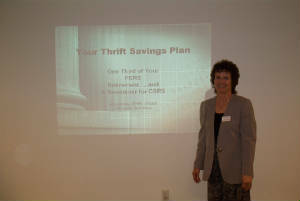 We show you the total picture including Social Security, FERS Supplement, and TSP with all your options for insurance. We help you maximize the benefits you have worked so hard to earn. Don't wait until just before retirement to decide on buying civilian or military service credit time or adjusting insurance or TSP! We will guide you through the maze of making the best long term retirement plan selections under FERCCA if you have been put into the wrong retirement system and we will help you complete waiver of overpayment letters where needed. We will work with your lawyer to insure your benefits are protected in divorce or review your existing decree prior to retirement. Many attorneys and judges are not familiar with the federal systems. Use of the wrong clause in a decree can make you worth more dead than alive! We also will work with you, your physicians, and your supervisors to compile a successful disability retirement package.